Emma Tupper is a lawyer with plans to make partner at her prestigious law firm. When her mother passes away and leaves her with an all-expenses paid trip to Africa in her will, asking her to experience it in her absence, Emma has a hard time resisting the trip. But things do not go according to her mother’s plan. Emma becomes ill, then gets trapped in the middle of nowhere in Africa after an earthquake hits. She is gone from home for 6 months before she finally makes it back into “civilization”. Emma is surprised to find that everything is NOT as she left it when she returns home. Her apartment has been leased to someone else, her possessions disposed of, and her boyfriend has already moved on-with the last person she ever would have expected. She is forced to start her career over again. Everyone seems to expect her to do something drastic and extreme, after having a major life event change everything for her. But Emma just wants to go back to the way things were-with the exception of inviting handsome, newly single photographer Dominic into her life. Can Emma go back to they way things were? Does she really want to go back? What would YOU change, if you lost everything and had to start over? 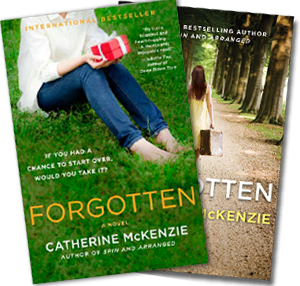 Forgotten, by Catherine McKenzie, is a novel about deciding what you value most in life, and bravely moving forward when you have been knocked down by life and have to put pieces back together that no longer fit like they should. If you like this novel, be sure to pick up Arranged, by the same author, which is about a woman who decides to use an arranged marriage service to find a husband (and everything goes terribly wrong).